Ichthyosaurs and dolphins are the archetypal examples of convergent evolution in action, in which two completely unrelated species acquire near identical characteristics. The discovery of a new ichthyosaur fossil suggests this Jurassic-era creature was even more dolphin-like than we appreciated, featuring warm-blood, blubber, and even similar camouflage. A remarkable 180-million-year-old fossil found in the Posidonia Shale Formation of southwestern Germany, of the species Stenopterygius ichthyosaur, is providing the best evidence yet that ichthyosaurs—ancient, dolphin-like marine reptiles—were warm-blooded creatures. 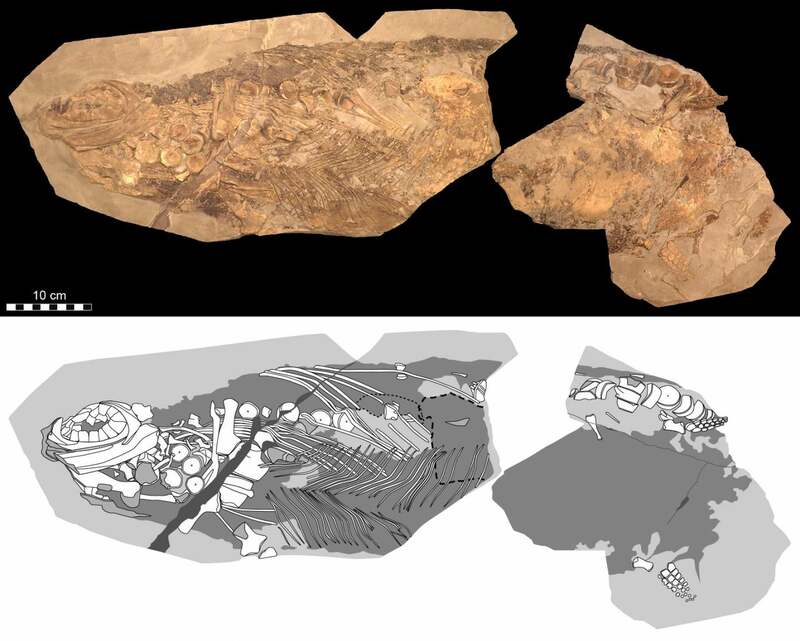 The preservation of the new fossil is so good, said lead researcher Johan Lindgren from Lund University in Sweden, that he was able to see outlines of the animal’s original, flexible skin, along with evidence of blubber underneath. What’s more, he and his colleagues were able to detect internal organs and, at the molecular scale, traces of cellular layers within the fossilised skin. It’s now the first example of fossilised ichthyosaur blubber in the scientific literature, pointing to ichthyosaurs as warm-blooded, or endothermic, organisms. Ichthyosaurs were contemporaneous to dinosaurs, but they were strikingly similar in appearance to modern toothed whales, most especially dolphins. Scientists suspected ichthyosaurs might be warm-blooded, based on estimates of their swimming speed, but this new discovery, the details of which were published yesterday in Nature, is the first to provide evidence in the form of fossilised subdermal soft-tissue. In modern aquatic mammals, blubber, in addition to acting as an insulating layer against the cold, aids in buoyancy and serves as a fat store. Cold-blooded creatures, which tend to live in warm climates, don’t really need it. But unlike sea turtles, who lay eggs on the beach, ichthyosaurs gave birth to live young, which is associated with warm-bloodedness, according to Lindgren. To study the fossil, Lindgren and his colleagues applied a multidisciplinary experimental approach to analyse both the structure and chemistry of the preserved soft parts. The researchers were able to identify cell-like microstructures, which held pigments within the animal’s skin, and traces of internal organs, including the liver. Countershading is also present in dolphins, serving as camouflage. In the case of ichthyosaurs, their countershading camouflage may have protected them from predators, like aerial pterosaurs from above, or aquatic pliosaurs from below, the researchers speculate. Lindgren said his team “conducted the most comprehensive and in-depth investigation ever undertaken on a soft-tissue fossil,” but admitted it was based on the analysis of a single individual. Future research “needs to be expanded to also include other specimens,” he said.